What have you done today to make you feel proud? Enter our Awards! The Made in the Midlands Awards are back and we're seeking your nominations. This year you can apply online and by October you could be receiving your award at our free breakfast ceremony. Let Made in the Midlands bang the drum on your behalf so we can share your incredible stories of innovation, investment and growth. Not just your run of the mill stuff either, but truly inspirational tales direct from the coalface! Last year's overall prize was won by Automotive Insulations and we're looking for more. 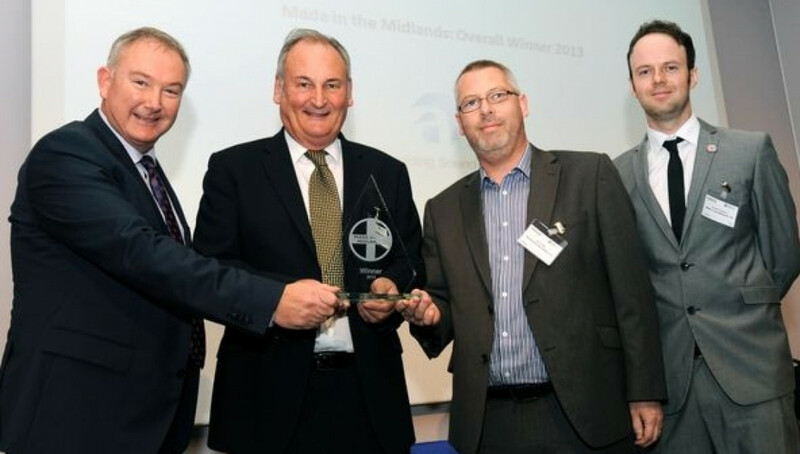 MD Jim Griffin said: "We were delighted to have our success formally recognised at the Made in the Midlands Awards. The region is such an important hub for manufacturing and industry, so the competition is always pretty stiff." We've been impressed by the exceptional standard each year and 2014 can be the best so far. Our Emily will be contacting you soon to tease out your inspirational stories. The awards are easy to enter so make sure you put yourself forward for recognition. The awards this year take place in Wolverhampton on Thursday October 16th. Remember it's free for Made in the Midlands members, so we look forward to seeing you on stage and across the media afterwards. Pictured left to right: Mark Evans - R&D Tax Claims, celebrity speaker Richard Noble, Jim Griffin - Automotive Insulations and Charles Addison - Made in the Midlands.